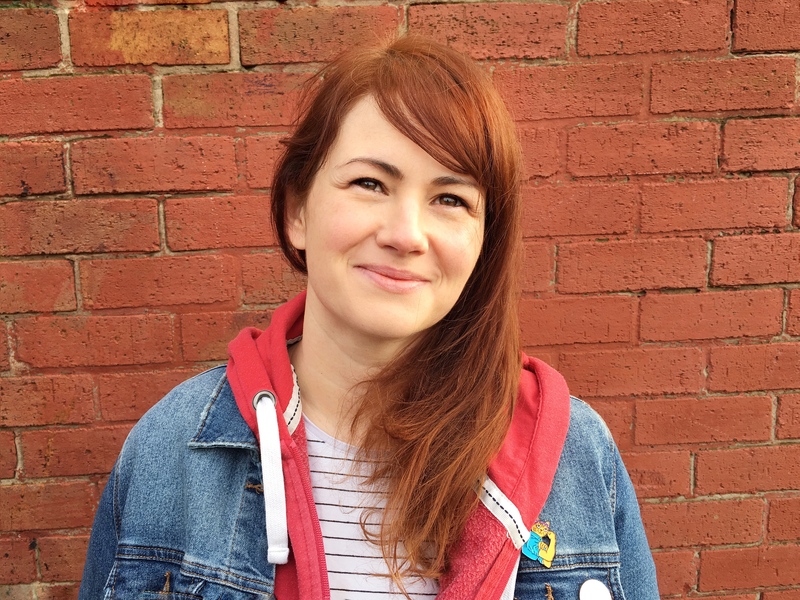 I’ve shared our love for Smiggle on here before when we went to visit the new store in Liverpool. They are still relatively new to the UK but the shops are popping up everywhere now and my boys absolutely love them. I love their range of kids stationery and it’s the perfect place to find something a little different. 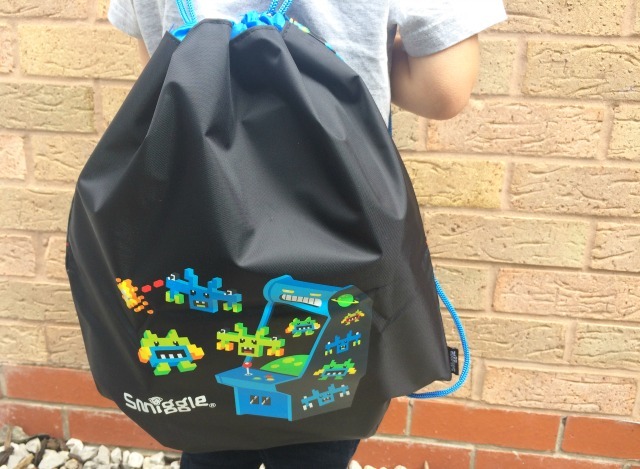 We’ve been sent a few bits and pieces from the new Smiggle Summer range and I’m so excited they have arrived just in time for our holiday. We have a long drive ahead of us so I’ve been able to pack these up to take on the road. I’ve managed to keep most of it out of the boys hands so I can’t wait to see their faces when they open up the bag and see what’s inside. 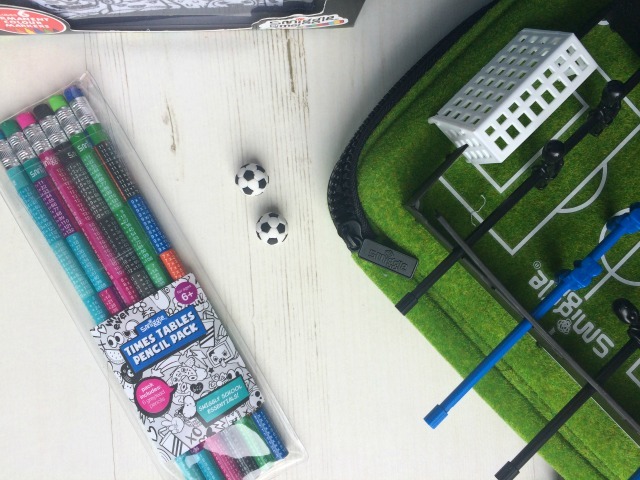 The football pencil case is probably my favourite thing our of everything – inside it’s a great pencil case that I’ve filled with pencils, pens and crayons, essentials for any holiday with three children. 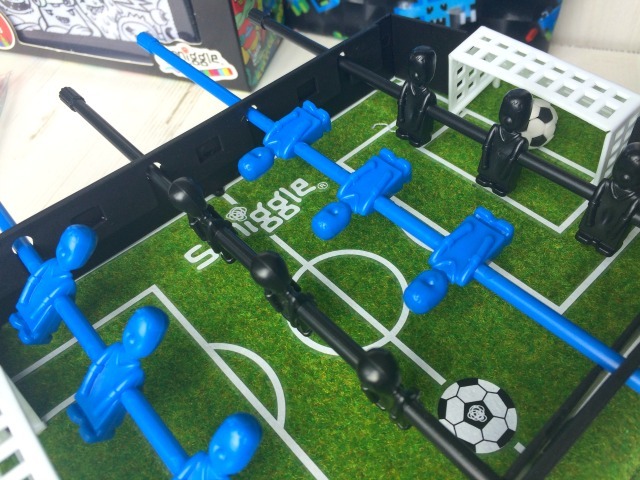 However this one is a little different as it also doubles up as a mini foosball table. It comes with the extra plastic pieces which just pop into the top of the pencil case and it even comes with two eraser footballs that you can play with. I love that it doubles up as two things and will be great on the ferry. I also put in some of these colourful timetable pencils, Lucas is drawing and writing wherever we go now so they’ll always come in handy. 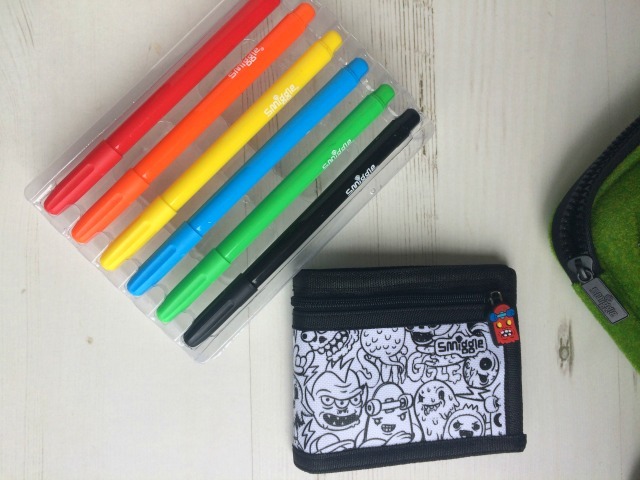 We also received a ‘colour your own’ wallet, it comes with a set of brightly coloured pens so you can colour the design in. Again, it’s something totally different and it looks like so much fun. I’m saving it for Lucas as the twins are a little young yet and I know Lucas will enjoy making the wallet his own! I’d have loved something like this when I was younger – in fact I wouldn’t mind colouring it in myself even now. Finally, we were sent a drawstring bag to keep everything in which is fantastic – it is already chock full ready for our summer trip. 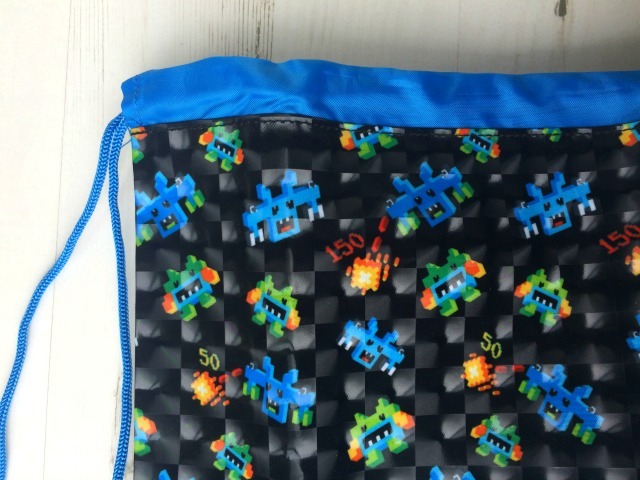 I love the colourful design and that it’s different on each side, it’s much sturdier than other similar bags. I let the twins try this out as they spotted me photographing it and of course were then very eager to wear it. It will get a lot of use over summer with our day trips. It’s wonderful to find such cool stationery for boys, usually it is more aimed towards girls so I’m delighted with the range we have been sent. 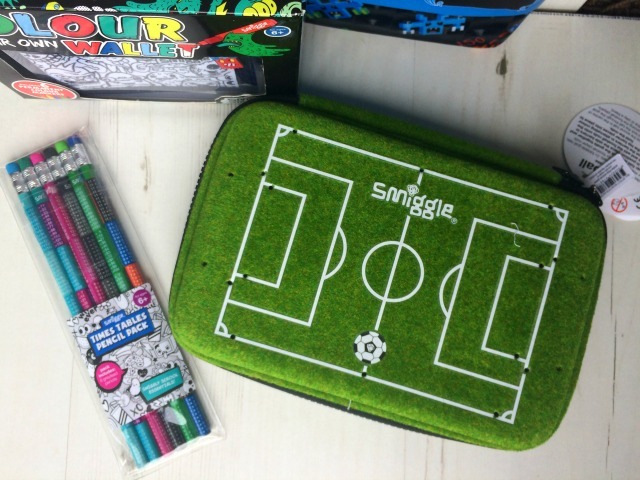 The designs always stand out and there is no other shop that can match Smiggle for colour. I’ve got all these goodies packed up now ready for our trip and I know the boys will so excited to have a play around with them. 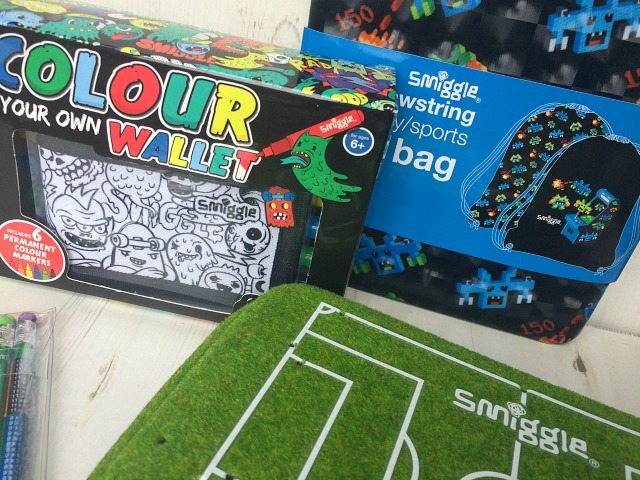 Thank you Smiggle for sending us these lovely items to review. As always, all thoughts and opinions are my own.